In 60 days, drone journalism will be legally possible in any newsroom in the United States. That’s not to say it will be easy, but it will be legally possible in ways that it has never been before. Today, the FAA released Part 107 of the Federal Aviation Regulations, which encompasses the new rules covering Unmanned Aerial Systems or drones or flying robots or whatever you want to call them. You can read all 600+ pages of it here or you can opt for the summary here. For journalists, this breaks down into three categories: Who, What, and Where. Under Part 107, you’ll have to be 16 years old, understand English and, most importantly, you have to have a Part 107 operators certificate. What does it take to get one? You have to take a knowledge test “that includes knowledge of airspace, airspace operating requirements, and the use of aeronautical charts” among other things. Generally, the FAA’s tests are 40 questions, multiple choice and you have to get a 70 percent to pass. Because I’m a college professor I have to say this: The test is not hard IF YOU STUDY. Really study. Learn what you need to learn. I missed one question on my knowledge test and I was angry that I missed it. Anyone committed to learning the material can pass the test. And you can take it again. But: The manned aircraft test costs $150 to take. I couldn’t find a cost anywhere, but I would assume it will be the same. Retaking gets expensive fast. The What rules are pretty much what we have been expecting since last February when the FAA started the process. There are a few tweaks here and there. No flight above 400 feet. Initially, it was 500 feet, but 400 aligns more with current restrictions and theoretically provides a 100-foot buffer between the lowest flying aircraft and the highest flying drone. No night flying. Initially, this was day flight only, but like everything in aviation, there are specific rules about what Day and Night are and Day does not include sunrise or sunset – the Golden Hour so beloved by photographers. It is now possible to fly in that golden hour. No reckless or careless operation. No flight over people plus no reckless or careless flight without specifics about what either of those means gives the FAA wide latitude to go after pilots they feel are operating poorly. So for journalists wanting to use drones to cover big protest marches, it means you’re going to have to rope off a space set back from the main group, keep people out of it, and do not leave that spot. And make sure you document what you’ve done to keep you drone from flying over people and keep them safe for when the FAA inspector comes calling. 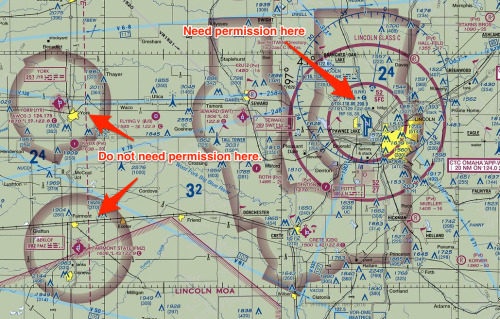 Flight in restricted airspace requires Air Traffic Control (ATC) permission. If you are within 5 miles of an airport with a tower, you will have to get permission from that tower to fly. That means large chunks of cities are going to require ATC permission first, and then you have to worry about the above flight over people restriction. How do you get ATC permission? That’s not clear yet, and it is being worked out. However, one nice change is that if you are near a small airport without a tower (Class G airspace) you do NOT need permission mostly because most Class G airports don’t have a tower. You are not required to have a visual observer, but if you’re going to use First Person View cameras, then you need one. The drone has to be within the pilot’s line of sight at all times. Under these rules, just about any story that isn’t breaking news can use drones without a ton of effort (provided you already have a licensed operator). Breaking news coverage in cities with drones will require some work. It will require newsrooms to meet with and discuss what they want with the local air traffic control facility in advance. In some places, operators have been able to get agreements from ATC where so long as the operator stays below an even lower altitude and operates under a set of heavier restrictions, then ATC gives them blanket permission to operate. Letters of agreement, as they’re called, are possible. Requiring pilots to have radios and be in contact with ATC is possible, but not likely because air traffic radio is busy already with manned aircraft. Or, this might just end up as a web form at the airport’s website, as is the case in Tampa and Phoenix. The fact is, we just don’t know how permission in controlled airspace will happen, and it will require local effort to work through it. I’ve touched on this, but it bears repeating. Flight in Class B, C, D and E airspace will require permission from ATC. What does that mean? We’ll, those airspace designations will be on the test, but the simplest thing to do if you are in the United States is to go here. Do you see all those circles? Those are airports with restricted airspace around them. If the circle is a fuzzy purple, then you don’t need permission, you just have to be smart and avoid the airport. Or, take a look at the airspace around Lincoln, Neb. A large chunk of the city is in Class C airspace, which is common around the US. Only the largest airports are Class B airspace (think: Chicago, Atlanta, Minneapolis, Newark, etc). Inside of five miles from the airport in Lincoln, which includes my office, I’ll need to get permission. Anywhere around here, outside of those five miles, I’m free to operate without ATC clearance. So the day we’ve been waiting for is here. The news is reasonably good. There are still challenges, and we haven’t even talked about state and local laws that have been piling up while the FAA lumbered toward today. But the future of drones in journalism is much brighter today than it has ever been.